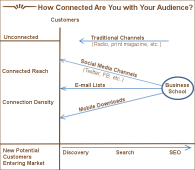 In our last edition of this column, we asked “How Connected Are You With Your Audience?” and introduced two new concepts: connected reach, the reach you have with your audience via channels that provide direct engagement, and connection density, the average amount of touch points you have with each member of your audience. The channels that provide direct communication are your social media channels, your e-mail lists and your mobile app. The inference of the idea is that the higher your reach, the greater your density, the more control you will have with your communications to the right audience. This time we are going to delve a little deeper, and examine how you can determine these numbers, and how you can increase those numbers. Goals for social media channels for most schools have focused on getting as many people to follow and fan channels, whether it is Facebook, Twitter or Instagram. Many also adopt the same idea with their e-mail lists, and the few schools that do have mobile apps, the same. This makes sense if you know you are engaging with your current audience. It becomes less clear when you are going into year two, three and four, of use of these same channels, without making any deliberate adjustments to move out those that no longer belong in the audience of “potential applicants”. How can this situation be remedied? One strategy would be to start new instances, with each of these channels, each year. Beginning in the early summer, transition your current admissions Twitter effort, to an effort for incoming students, then current students, and a few years later, alumni. Same for Facebook, your e-mail list, and so forth. Encourage those who have “dropped out” (not admitted, or did not apply, or did not matriculate) to leave the channel. With this strategy, you are no longer focused on absolute numbers of followers and fans, but you are focusing on the real audience, and are then better able to measure the connected reach you have with that audience, as well as its connected density. The content you send through these channels can be focused on the right audience, as that audience transforms over the years. How do you increase your connected reach, and connected density? Adopting the above strategy will be one means of impacting those numbers – for the simple reason that you will be providing more focused and useful content to those who will appreciate that content. That’s simple target marketing. At the beginning of the cycle, you want to gain as many potential applicants as possible, within reason, to join your channels. At this time, neither the potential applicants, nor you, know if you are a good fit. But these channels can help candidates make that decision. You simply need to be very deliberate about marketing these new channels using all other channels that you have available. Content that is share-able will be important too. How will you get those who initially sign up to your channels to share your content, to stimulate others that they are connected to, to then follow and engage? While measuring the performance of your content marketing and social media activities is still an evolving science, it’s clearly time that schools move out of the very basic measures of ‘fans’, ‘followers’ – or even engagement – and instead focus on engagement with the right audience. This is where our concepts – connected reach and connection density – can be vital tools. For more information about our work in this domain and your school’s marketing activities, contact us here.